The OPET 2018 Annual Newsletter is here! A Rare Species and Habitat Investigation Report of the Oyster Pond Headwaters Land by Pam Polloni and Don Schall. working with the Town of Falmouth and other organizations to support the long-term preservation of the pond. On August 15th, the Town of Falmouth Water Quality Management Committee (WQMC) held a meeting to discuss options for removing the excess nitrogen from Oyster Pond. It is looking for public input on the proposed plans for Oyster Pond. Video of the meeting is available and there is an article about the meeting in the Falmouth Enterprise. The WQMC is responsible for seeking solutions for cleaning up Falmouth’s estuaries. Fifteen estuaries in Falmouth are degraded due to too much nitrogen. The Town of Falmouth is mandated to reduce this nitrogen entering these estuaries by the Clean Water Act of 1973. It is working with consultants to develop Comprehensive Wastewater Management Plans (CWMP) for each of these impacted water bodies. Oyster Pond is one of these estuaries and this meeting was to discuss the options for cleaning up the pond. Proposed Treatment Plan 1 for Oyster Pond. Parcels in yellow would be connected to the sewer system. A total of 145 dwelling units from 85 parcels would be connected. Proposed Treatment Plan 5 map for Advanced Innovative and Alternative Septic Systems. A total of 204 dwelling units would be required to upgrade to a denitrifying septic system. More parcels are included in this plan than in Plan 1. This is because all of the nutrients from households in Plan 1 would be taken out of the pond's watershed. In contrast, nitrogen would still be released to the pond under Plan 5. This requires a greater number of homes to participate to meet the required nitrogen levels. The high nitrogen levels in Oyster Pond are from too many conventional septic systems in the watershed. Existing Title V septic systems are great at removing pathogens from entering groundwater, but not nitrogen. Just as nitrogen feeds your garden plants, it also feeds the plants or algae in the pond. Too much nitrogen along with low salinity levels in the pond caused the algal bloom in the summer of 2016. Removing this pollution source will be the key to restoring Oyster Pond to a healthier ecosystem. The two clean-up options include installing sewer lines in a portion of the watershed OR requiring nearly all the homes in the watershed to upgrade their septic system to a denitrifying system (the yellow areas in the above map). The Town will decide between the two options over the next year. A final plan for Oyster Pond is due to the state Department of Environmental Protection (DEP) by December 2019. Read more about these options in the Alternative Analysis section of the Comprehensive Wastewater Management Plan for Oyster Pond (CWMP). Additional chapters of the Oyster Pond CWMP and more information about nutrient management in general can be found here. We hope you enjoyed the talk at the OPET Annual Meeting by MaryKay Fox. MaryKay talked about how to attract butterflies and bees to your garden. She presented a lot of information and lists of plants that grow well with on Cape Cod. MaryKay has shared her slides and you can see the lists here. Here is the new trail map for OPET's Conservation Land! A trail map guide will be available soon! Sampling locations for the CTD casts and other equipment. OPET is thankful for the help of scientists at the Woods Hole Oceanographic Institution who are helping understand the Oyster Pond system. Intrigued by the Oyster Pond’s dynamic system, four Woods Hole Oceanographic Institution scientists are donating their time and instruments to study the pond’s salinity levels. Dr. Rocky Geyer, Dr. Malcolm Sculley, Dr. Mike Spall and Dr. David Ralston are helping OPET understand the role of high tides, wind, and the pond’s outflow in regulating its salinity. OPET is trying to return Oyster Pond to its optimal salinity levels between 2 ppt (parts per thousand) and 4 ppt. Currently, the surface of the pond is at 1.9ppt, very close to the target! In contrast, Vineyard Sound’s salinity is about 32 ppt. This salinity range was selected after the pond experienced a dramatic decline in water quality in the 1980s. The decline was caused by two major environmental changes. There was a drastic increase in nutrient levels (nitrates, phosphates) in the pond, due to the burgeoning human population in the pond's watershed area. Additionally, salinity levels increased dramatically with the construction of a new, much larger culvert at the pond's outlet into the Lagoon. This new culvert was too large and allowed in too much salt water. As a result, the heavier salt water sank to the bottom of the deep basins in the pond. This salt water was anoxic, or lacked oxygen, and stressed the pond’s ecosystem. Scientists studying the pond agreed that a return to the former brackish salinity levels would improve water quality by increasing oxygen levels to deeper depths. This again illustrates that managing Oyster Pond is always a balancing act! Now we need to increase the salinity. Working with the WHOI scientists, we hope to answer the following questions: when are the tides high enough to bring salt water into the pond, how often does this happen, what are the impacts of storms and wind, and how much salt water is needed to maintain appropriate salinity levels? It is known that big tides bring salt water into the pond, but we don’t know how frequently this happens or the volume of the water. In mid-July, RBR 420 Temperature/salinity sensors with Hobo pressure sensors were placed at the entrance to Oyster Pond (station #9 on the map) and the Lagoon (not shown on map). Each was about a foot below the water surface in just over two feet of water. At the OP1 (station #2) and OP3 (station #7) moorings, Seabird microcat temperature/salinity/oxygen sensors were deployed at about 3 feet below the surface and 3 feet above the bottom of the pond. The instruments were retrieved at the beginning of November. The top panel displays water level data from two Hobo sensors located at Trunk River and at the entrance to the pond. The water height of Vineyard Sound at Woods Hole is also shown for a tidal reference (divided by two to fit on the same scale). The vertical lines mark the start of each month. The big surge from the October 30th storm is clearly seen! It also shows the “spring tides”. Spring tides are a bit of a misnomer. Spring tides occur each month during the new and full moons not just during spring. Rather, the name derives from the saying “springing forth.” The graph demonstrates that salt water can only enter Trunk River during the spring tides or when there are strong east winds during a storm. The water level has to be higher in Vineyard Sound than in Trunk River. During the four month recording period, this happened five times. When this happens, the salinity in Trunk River is nearly as high as Vineyard Sound. The middle panel shows the salinity levels over the four months. At least five big influxes of high salinity water entered the pond, generally corresponding with increased water level in Trunk River from the Sound. Each event pushed the salinity in the pond up a little bit. The RBR at Trunk River stopped recording in mid-October because it became clogged with an eel grass/algal mat. The bottom panel is temperature from both the RBRs and the Hobos. The instruments track each other except midway through when the RBR at Trunk River became clogged. Additional data was also collected with a CTD or a Conductivity, Temperature, and Depth sensor. While the other instruments were left in place for three months, the CTD was simply dropped over the side of a boat or canoe and pulled up at the nine stations shown on the map on three occasions. (If you would like to volunteer to take out the moderately sized CTD to sample the pond, please contact us at info@opet.org). You can see over time the salinity increasing at all of the locations, especially after the October 30th storm. Again, it brought in a substantial slug of sea water into the pond. The higher salinity in the deep basins are reservoirs of high salt water that can mix with the upper levels during high wind events. The temperature sensor also shows that this salt water input was warmer than the pond water. There were problems with the oxygen sensor so they are not displayed here. OPET will continue to work with these scientists and regularly monitor the salinity of the pond as we have done for many years. The next step is to understand to review and analyze the data as to what dredging is needed to keep Trunk River and the Lagoon open to allow the inflow of salt water. Dr. Jeff Donnelly, the featured speaker at the OPET 2017 Annual Meeting. A big thank you to Dr. Jeff Donnelly for his excellent talk titled “Chasing Ancient Hurricanes in Oyster Pond and Beyond" at the 2017 Annual Meeting. He revealed how he uses sediment cores from the bottom of Oyster Pond and elsewhere to study the long term record of hurricanes. He uses pollen, lead and radioactive tracers to date storm events. Maize pollen in Oyster Pond’s cores shows that Native Americans were growing corn on the shores of the pond by the late 1400s. Around 1665 rye pollen starting appearing in the cores, an indication that Europeans started farming in the area. He also presented a lot of information about Oyster Pond, including the surprise that a section of the pond is a submerged white cedar swamp! Another surprise was the high amount of sand inputs during the 18th century. It was not due to a large number of storms, only two hurricanes were documented during this time, but rather to a direct outlet to Vineyard Sound that was created by a circa 1675 storm. The outlet allowed sand to be easily carried into the pond. This parallels with the history of Oyster Pond in Falmouth’s Town Meeting. Starting in 1765, the Town hired someone to keep the outlet open and therefore the salinity high enough to support oysters. For decades the Town struggled with this effort, battling storms that continually filled the outlet. (We face the same problem today with Trunk River!) It ultimately proved to be too difficult in the era of only manual labor and abandoned the effort in the early 1800s. Is a changing climate impacting the intensity and frequency of hurricanes? in Oyster Pond and Beyond"
Waves from the 1938 hurricane crashing into Woods Hole. Copyright Woods Hole Oceanographic Institution. Come learn the role Oyster Pond plays in understanding how a changing climate can impact the intensity and frequency of hurricanes. Dr. Donnelly will explain how he uses sediment cores from the bottom of Oyster Pond and elsewhere to study the long term record of hurricanes. Wind and waves from these storms carry sand into the ponds where it settles to the bottom. Over time, the sand is covered by black organic mud that accumulates during non-event years. These dark and light layers tell the hurricane history of a location while radiocarbon dating can pinpoint the date the storms occurred. He uses this history to study how hurricane activity has varied over the last few thousand years and whether a changing climate is impacting the rate and intensity of these storms. Studying this environmental past can help predict what future storms might bring. Watch a video of Jeff's work that was filmed on Oyster Pond for the National Science Foundation and NBC Learn! Here is another video of Jeff from the National Geographic's Years of Living Dangerously show where this time he is taking sediment cores from Blue Holes or sink holes in the Caribbean. Dr. Donnelly is a Senior Scientist at the Woods Hole Oceanographic Institution in the Geology and Geophysics Department and an Adjunct Professor of Geological Sciences at Brown University. The overarching goal of his research is to understand how climate variability changes tropical cyclone activity, alters sea levels, and affects water availability. In addition, he seeks to understand the impact of changing climate on terrestrial and coastal land forms and ecosystems. Dr. Donnelly's talk will be preceded by a short OPET business meeting. The public is welcome. Light refreshments will be served. Email info@opet.org for questions. 750 Cubic Yards Dredged from the Lagoon! Many thanks go out again to Chuck Martinsen, Deputy Director of the Town of Falmouth Marine and Environmental Services!! He coordinated the huge effort to have the Lagoon dredged in the first week of February. Not only was the blockage in the Lagoon stopping the inflow of salt water from the Sound, but also the passage of herring and other migrating fish. Chuck secured permission from the Conservation Commission, worked out the funding and assistance from the DPW and hired Chip Schultz to do the work. A view of the dredging from a drone. What a huge job this turned out to be! It took a week to set up the equipment, do the job, dissemble everything and clean up the area. The big pile of goop. At least 750 cubic yards of muck were dredged from the Lagoon. And muck it was. The constituency was like chocolate pudding, but much smellier. There was a strong sulfur smell the entire time from the rotting eelgrass. It was multi stepped process to do this. First a dragline scooped the sludge to the edge of the Lagoon. Then a clam-shell bucket pick up the much and dumped into trucks. The trucks dumped the gunk at the edge of the Trunk River parking lot to dry out. This is so the dump trucks would not be leaking the smelly load all over Falmouth’s roads. The next day a front loader scooped up the drier gunk into a Falmouth DPW dump truck. It was then hauled up to the Town’s compost/leaf dump facility. This nutrient rich stuff will be great for your gardens! Whew, what a huge amount of work and we are so thankful for the Town’s investment in this effort! The good news is that we are seeing an increase in the salinity levels in the Lagoon and the weir area. We are hopeful the spring high tides will bring in even more salt water into the pond. Lagoon Dredging Feb. 2, 2017 from OPET on Vimeo. OPET’s worries about the health risks of last summer’s algal bloom were confirmed by a student’s research project. Kristy Sullivan, an undergraduate at Wheaton College, studied the algal bloom as her project in the Semester in Environmental Science program at the Marine Biological Laboratory. She introduced nutrients in water and sediments samples from Oyster Pond to try and replicate the bloom. She found five types of freshwater algae growing in the samples including the cyanobacteria Microcystis and Aphanocapsa. Both of these can produce microcystin, a toxin that can cause nausea, vomiting, paralysis and acute liver failure in large doses or with long term exposure. We don’t know if the bloom ever reached toxic levels, but we are glad we took the precaution of warning the public to avoid contact with the water last September. A finding of particular concern is that it appears Microcystis is overwintering in the sediment. If we have the same conditions as last summer, we might experience another bloom. This is why OPET is continuing to work with the Town to increase the inflow of saline water from Vineyard Sound. Increasing the salinity will dampen the growth of the freshwater algae. Ms. Sullivan introduced nitrogen, phosphorus and nitrogen + phosphorus to water and sediment samples from Oyster Pond. The combination of nitrogen and phosphorus created the largest algal growth in both the water and sediment samples. This demonstrates that Oyster Pond is sensitive to both nutrients, unlike most water bodies. This is an important consideration in developing a water quality protection plan for Oyster Pond. While salt ponds are sensitive to nitrogen, it is phosphorus that impacts freshwaters. Oyster Pond is managed as a brackish system due to its unique configuration and limited exchange with the ocean. Despite OPET’s removal of the phragmites clogging the Trunk River and the dredging of 20 cubic yards of material by the Falmouth DPW this fall, it is not enough. There is still not enough salt water reaching the pond. The ideal salinity range for Oyster Pond is between 2 – 4ppt. After the dredging, the salinity crept up from 0.9 ppt to 1ppt (in contrast Vineyard Sound is 32ppt). At a meeting between OPET, Chuck Martinsen, Deputy Director of Marine and Environmental Services and Dr. Brian Howes of UMass Dartmouth and author of the Massachusetts Estuaries Report on Oyster Pond, it was decided that the Lagoon must also be dredged. Large storms, particularly in the fall and spring, push large amounts of sand and eelgrass up Trunk River and dump it in the Lagoon. There is not a correspondingly strong outflow from the pond to push this debris back out. It builds up over time, eventually blocking the water exchange between the pond and Vineyard Sound. Thanks again to Chuck Martinsen; the Lagoon will be dredged this week using a crane and a 1,000 foot dragline. Periodic maintenance dredging of the Lagoon will need to be included as part of any water quality plan for Oyster Pond. The water quality of the pond is improving! The nearly 2 inches of rain in mid-September and the opening up of Trunk River helped flush out much of the algal bloom. The cooler and shorter days are also helping. The pond is losing its pea-green color. Many thanks again to Chuck Martinsen, Falmouth's Herring Warden and Deputy Director of Marine and Environmental Services for all his work to help OPET improve the condition of the pond. Many thanks also to Dr. Brian Howes, Director of the Coastal Systems Group at UMass Dartmouth and author of the Mass Estuaries Project Report on Oyster Pond. Chuck and Brian met to review the condition of the pond and agreed that Trunk River needed additional work to allow the pond to flow more freely to break up the algal bloom. They directed the Falmouht DPW to remove an additional 16 cubic yards of material from the river. This is in addition to the 8 cubic yards already removed in August. The dredging substantially increased the outflow of water from the pond from 736 m3/day to 2,600 m3/day. Water clarity is also improving as the density of the algae dissipates. On August 24th a sample had 1,768 cells of algae per .1m of water, by October 3rd it had fallen to only six cells per .1m. This means we can now see down several feet into the water, while during the densest part of the bloom, nothing could be seen below 7 inches! number of dead fish were in the tens, not hundreds. However, because they are scavenged so quickly by gulls and other animals, it is difficult to know the exact numbers. Our regular water sampling during the bloom showed that the levels of nitrogen in the upper cove were double what they need to be to restore the pond back to healthy conditions. This again demonstrates that not only do we need to continue to monitor the flushing and outflow of the pond, but also in the long term limit the amount of nitrogen and phosphorus entering the pond from septic systems. The massive blue-green algal bloom impacting Oyster Pond is not going away despite our initial efforts working with the Town to increase the outflow of Trunk River. The bloom is caused by a combination of excess nutrients (phosphorus and nitrogen), sunlight, low-water or low-flow conditions and warm temperatures. Dr. Aimlee Laderman, Lecturer at the School of Forestry and Environmental Studies at Yale University and a limnologist at the Marine Biological Laboratory, looked at photographs of the algae in the pond and identified it as a very dense bloom of freshwater blue-green Cyanophyta, indicative of severe eutrophication. OPET is working vigorously to alleviate the situation and find a short term solution to help the pond. Two things are needed to improve the water quality - rain and lots of it to dilute the nutrient pollution and in-flow from Vineyard Sound to bring in salt water to restrict the growth of this freshwater algae. OPET is working with local scientists and engineers to design a plan to allow salt water into the pond to take to the Town for their approval. In the meantime, OPET thought it prudent to warn our Oyster Pond neighbors to limit contact with the water. In some instances, cyanophyta blooms can sicken people and pets and cause skin rashes, eye irritation, and possible gastrointestinal distress when ingested in large quantities. Some Cyanophyta blooms can also cause the death of fish. This is more likely due to the simple lack of oxygen rather than the effects of the cyanophyta. As the algae overgrow and die, the oxygen in the water column disappears. The Charles River is also experiencing a cyanobacteria bloom and public officials there have warned the public to avoid contact with the water as it is difficult to determine if a bloom can cause health problems. Therefore, as a precaution, we suggest you and your pets avoid contact with the water and thoroughly rinse contacted areas after exposure. A secchi disk is an ingeniously simple device to check water clarity and the density of algae. Usually, the disk is visible down to 5 feet during the summer. As of mid September, it was just over a foot. As stated above, we are strenuously working for a quick, emergency solution to the pond's current state. However, this bloom brings into focus the deeper underlying problems with Oyster Pond -- there is too much nitrogen and phosphorus from septic systems polluting the pond. In the long run, we must prevent another algal bloom by capturing these nutrients before they enter the pond. Either a sewer system must be installed or septic systems upgraded to include a denitrifying component. The Town is continuing to study what option will work best for the Oyster Pond watershed. What a startling difference in this aerial view between the blue Salt Pond and pea-green Oyster Pond! Salt Pond has far fewer houses in its watershed and therefore far less nutrients polluting its water. Great talk on Mosquitoes at the OPET Annual Meeting ! Gabrielle Sakolsky, Assistant Superintendent and Entomologist of the Barnstable County Cape Cod Mosquito Control gave a great talk at the OPET Annual Meeting about the efforts of her office to trap, monitor and control mosquitoes and their diseases. Although the risk of a Zika outbreak here is extremely low, other mosquito borne diseases such as West Nile and Eastern Equine Encephalitis are of concern. Plans for the new Headwaters land are underway! Now that we've purchased the Headwaters land, thanks to you, plans are underway to draft a management plan and improve the trail system. This is the fun part! Watch the video to see the latest on plans to expand the trail system and see beautiful features of the Headwaters Property. OPET is beginning to design a circular trail system to link together points of interest in the new Headwaters property with the existing trails. We are trying to balance access to interesting features while protecting fragile resources and maintaining a buffer to neighbors’ backyards. There are already informal neighborhood trails linking Ransom Road to Fells Road and one running up to Hackmatack Way. There are also existing trails in Zinn Park, the conservation land OPET acquired in the mid 1990s (green dotted lines). OPET President Bill Kerfoot at one of the boundary markers on the new Headwaters land. The first step to managing the land is finding its boundaries! It is always nice when you can find these as they are usually hidden under years of leaves and dirt. Mark Robinson of the Compact of Cape Cod with a GPS in hand scouting out new trails and identifying interesting features. An example of the challenging type of landscape we face for the new trails. The above map shows some possible new trails layouts. In January, Mark Robinson of the Compact of Cape Cod Conservation Trusts helped us start mapping and considering the new routes. Mark had a handheld gps that tracked our movements as we cut our way through the Headwaters property (purple dotted lines). This work is only possible in the winter as the vegetation is incredibly dense the rest of the year! We also identified some features to highlight in a future trail guide. Once the snow has melted enough we will go back out again with the GPS to map the remaining proposed trails (yellow dotted lines). We might discover new routes when we are back in the field. It's official, OPET now owns the Headwaters of Oyster Pond! John Dowling, OPET's President, shakes hands with Jeffrey Fernandez, WHOI's CFO to celebrate the land transfer. Photo by Jayne Doucette, copyright Woods Hole Oceanographic Institution. On October 19th, the land transfer was completed and OPET officially acquired the 22 acre Headwaters of Oyster Pond from WHOI. Thanks to a flurry of last minute donations, we closed the remaining $30,000 funding gap. The Headwaters will now be protected in perpetuity for all the citizens of Falmouth! This is all possible due to YOU and all of your generous donations. So many people were involved in this purchase. We had 230 donors with donations ranging from $5 to the $500,000. 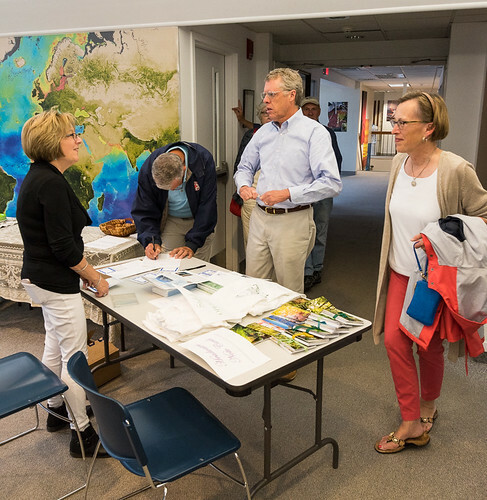 Donations came from the Massachusetts Landscape Partnership fund, the Town of Falmouth Community Preservation Fund, foundations, The 300 Committee Land Trust, the Compact of Cape Cod Land Trusts, other non-profits and many, many private donors. It really did take a village to purchase this land! Now our attention turns to managing this beautiful property and improving the public access. Any gifts that were received in excess of the purchase price and expenses will become the foundation for a Headwaters long-term stewardship fund. This winter will be spent mapping out trails and developing a management plan. Other plans include installing a three space parking area and an informational kiosk. We will keep you up to date with these plans as they progress. A slideshow of the land. Wood frogs "quacking" and spring peepers singing at one of the vernal pools. Vernal Pool Chorus from OPET on Vimeo. Now you can support OPET everytime you shop through Amazon. If you are an Amazon customer, you can support OPET every time you purchase or download eligible items. Amazon will donate 0.5% of your purchases to OPET through the Amazon Smile program. to improve the pond’s health.